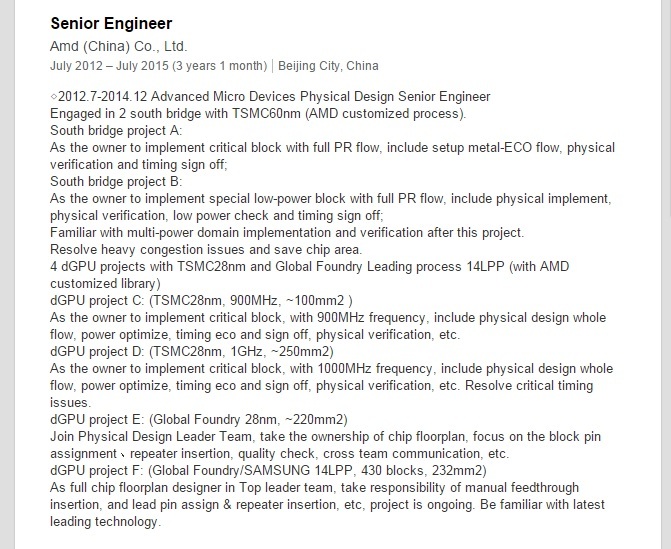 Details of AMD’s upcoming 14nm GPU have finally started leaking out. 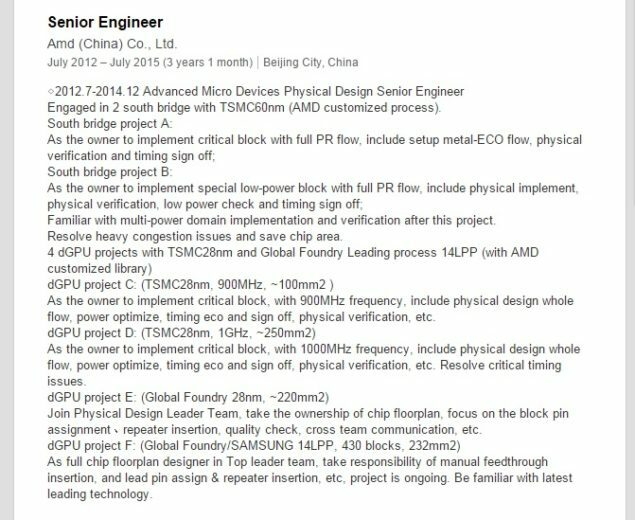 Some good detective work by the user AnarchX over at Beyond3D forums has revealed what appears to be the LinkedIn profile of a senior engineer at AMD. Interestingly, the engineer lists multiple projects, one of which is the Polaris die. The size of the chip will be 232mm² and (assuming the information is accurate) will constitute one tier of the Polaris architecture. Lets start with the customary context. AMD revealed its 14nm based Polaris lineup some time ago and the fact that it will be based on a FinFET process. Initially AMD did not clearly mention whether the process would be 14nm or 16nm, something which was later clarified as being only 14nm (for Polaris architecture). We also learned that AMD is focusing on bringing the ‘minimum spec VR’ level of performance (think R9 290 or a GTX 970) to more affordable levels and within reach of more gamers. All this ties in with the Polaris strategy – which is broken down into Polaris 10 and Polaris 11. As full chip floorplan designer in Top leader team, take responsibility of manual feedthrough insertion, and lead pin assign & repeater insertion, etc, project is ongoing. Be familiar with latest leading technology. According to the information we have about the 14nm LPP process, and based on transistor density increase, a 232mm² GPU would be roughly equivalent to a 464mm² 28nm processor – at the same TDP levels. Since we already know that AMD is going to be focusing not just on performance but power efficiency as well – this number could be be much higher, in fact we will discuss the number AMD is using below. We can however safely say that this die is more than capable of meeting the ‘minimum VR spec that AMD promises. The shift to 14nm becomes highly significant in this aspect. Not only does the die shrink allow for more transistors to be placed on the same surface area, it increases economies of scale – lowering cost. But the maturity of the process (14nm LPP has a 20nm backbone) would allow good yields and more volume to be shipped. AMD hopes to exercise this advantage by lowering the cost of “minimum spec VR” to a point below the $349 mark – making VR available to everyone and increasing the Total Available Market for VR. The more astute of our readers would notice one inconsistency with this information. A 232mm² does not fit with the positioning of the small Polaris die, which according to our estimates should have been around 150mm² and doesn’t fit well with our image of big Polaris which should have been near the 300mm² mark. 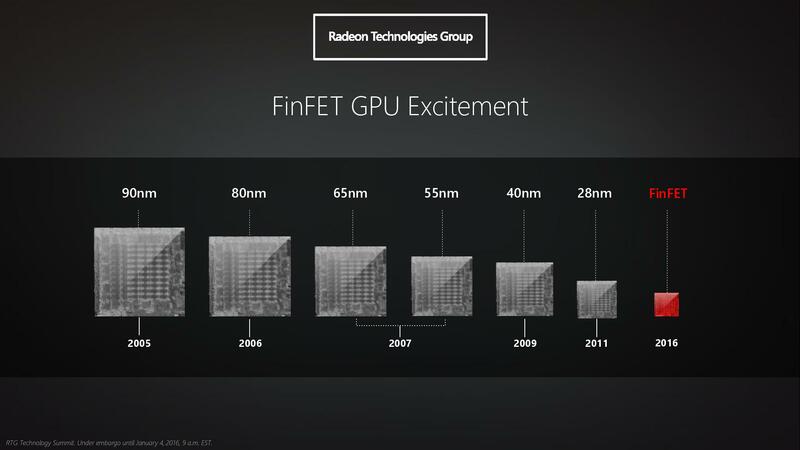 If you were to take a look at the AMD slide given above and calculate the die shrinks associated with the 14nm jump – the number would be exactly 2.5. If you remember, Raja Koduri has previously tweeted about Polaris being “2.5 times brighter” in the past – so the number 2.5 times is one AMD is throwing around alot. A 232mm² die multiplied by 2.5 times gives us the performance range of a 28nm 580mm² chip (at the same TDP level) which would be pretty damn impressive. We do not know what kind of power efficiency mix AMD is playing with here so it would be pointless to speculate further about the exact performance levels at this point. It would however, be prudent to keep in mind the difference between a 28nm and 14nm die. At any rate, here are the two possibilities with this leak: 1) The information revealed is simply of a chip design that never went on to see the light of the day (the engineer just worked in the building of the floorplan design – which is a long way from taping out) or 2) we are looking at the real deal and something which will target new levels of performance/watt and affordability to bring VR-Ready performance levels to more gamers. If the latter is true than we could see an even powerful GPU from AMD further down the road.